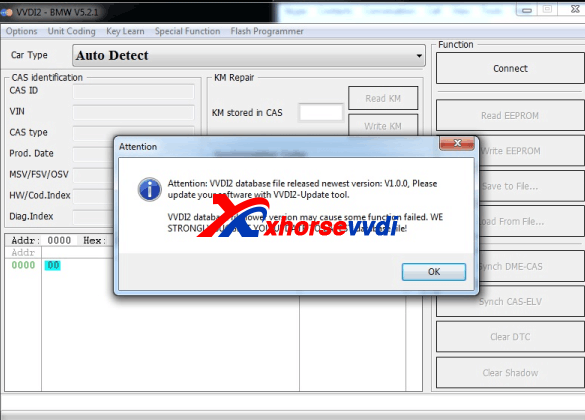 How to use Xhorse VVDI2 Full Authorization Key Programmer? VVDI2 full authorization includes all authorization for VVDI2 at present:BMW OBD,CAS4,BMW FEM,VAG 4TH,5TH,ID48 96bit,ID48 OBDII,PSA,Porsche,MQB,transponder programmer,J2534,prepare toyota h chip. 1.How to choose the VVDI2?VVDI2 Full or VVDI2 Advance version? 2.How to Get MQB Authorization? If you VVDI2 is advance version,it means you have BMW OBD,CAS4,VAG 4TH 5TH authorization,you can activate MQB free. If not advance version,buy ID48 96bit authorization,you can get MQB too. 3.How to get Toyota H Authorization? Toyota H chip authorization,VVDI2 advance version customer can get it free,you need activate by yourself in self-service system. 4.How to get cs/pin mac function?and Database EU verison? Please send us your vvdi2 serial number and your country,we will apply to activate for you. 5.VVDI2 and VVDI Key Tool ID48 96bit Authorization? If you have both VVDI2 and KeyTool,you can open VVDI2 ID48 96bit,bind VVDI2 with VVDI Key Tool,then your KeyTool can get ID48 96bit free. 6.How to solve VVDI2 BMW Software Database Update error?software and firmware already the latest version? VVDI2 database file lower version may cause some function failed. We strongly suggest you update to latest database file!